Home > Practice Jewel / Massage manEdger > Clinic Settings and Management > How do I manage practitioner SOAP notes? "How do I manage practitioner SOAP Notes?" From time to time, you may wish to obtain a copy of the SOAP Notes over a specified period of time for yourself or a specific practitioner. Here's how this can be done. Click on the “PRINT SOAP NOTES” tab. From here, you can select the date range of notes you wish to obtain. You may set the practitioner filter to All practitioners, or select a single practitioner from the practitioner list. 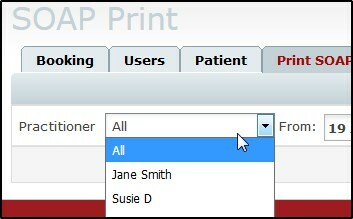 Clicking the PRINT button will generate a PDF file containing all of the notes for the selected practitioner and date range which can then be save or print locally.